In recent centuries, the principal migration of the world’s population has been from rural areas to urban areas. As late as 1900, less than 20 percent of the world’s population lived in urban areas. That figure has now risen to more than 50 percent. Urbanization occurred earliest in the first world, as the increased wealth produced by the industrial revolution attracted people from the countryside. In 1900, 40 percent of the US population was urban, a figure that had risen to 80 percent by 2005. Trends in Europe, Japan and other first world nations are similar. The migration to cities has been slower to start in the less developed world. Only in 2005 did China achieve a 40 percent urbanization rate. Urbanization is expected to continue virtually everywhere, with the world rate increasing to 70 percent by 2050. Nowhere, however, are the trends starker than in Bangladesh and its capital, Dhaka, which I had the privilege of visiting a few weeks ago. Bangladesh is approaching 160 million people, despite having a land area less than that of Wisconsin. Its population density, rural and urban combined, is approximately 3,200 per square mile (1,250 per square kilometer) and is nearly equal to that of the Portland urban (urbanized) area, which had 3,300 per square mile. The nation’s population density is more than three times the minimum population density used by census authorities in the United States, France, the United Kingdom and Canada for definition of urban areas. However, most of Bangladesh is not urban. The United Nations puts the urban share of the Bangladesh population at 28 percent, barely two-thirds of the less developed world average. Even this is a stunning increase from the less than 5 percent of 1950. By 2050, the United Nations says that the urban areas of Bangladesh will add 97 million people, as the rural population declines, sending the urban population to roughly 60 percent of the total. Growing Dhaka: Dhaka is the world’s newest megacity, with an urban agglomeration just over 10 million population (based upon United Nations population growth rate projections). There are few urban areas in the world that are growing faster. Historically, nearly one-third of the urban population increase in Bangladesh has been in Dhaka. This seems likely to continue, since the nation has few other urban centers. The second largest, Chittagong, is just one-third the size of Dhaka. At projected urban population growth rates, Dhaka could have 40 million people by 2050. Dhaka’s Unfortunate Location: As difficult to imagine as this urban growth may seem, other emerging super-cities such as Shanghai can be imagined with 40 million people, with their plentiful supply of quality land for development. Things are much different in Dhaka. No rapidly expanding urban area (and no nation) faces greater locational challenges. Dhaka could be the most inconveniently placed urban area in the world, even worse than New Orleans. The urban area sits on the world’s largest river delta, the Ganges – Brahmaputra Delta (The Ganges is called the Padma River in Bangladesh). This Delta, nearly the size of Oregon, is more than 1.5 times the size of the nation, though not all of the nation is in the Delta. Dhaka itself is virtually surrounded by the rivers of the Ganges-Brahmaputra system, from which most of it is protected from routine and disastrous floods by floodwalls. The main channel of the Ganges is less than 20 miles distant the confluence with the Brahmaputra and is less than 50 miles away and the Indian Ocean (Bay of Bengal), barely 100 miles away. Dhaka lies at a low elevation, so rising sea levels could intensify the problem. The same river delta is also home to another megacity, Kolkata (India). However Kolkata’s geographical challenges are far less, with fewer Ganges outlet channels and less in wetlands, which has permitted it to develop at one-third the density of Dhaka. Dhaka’s Unprecedented Population Density: The urban area is the world’s most dense, having recently passed Hong Kong (based, again on United Nations estimates and projections). Covering a land area of little more than 100 square miles, Dhaka’s population density is now approaching in excess of 100,000 per square mile (40,000 per square kilometer). At that density, the New York urban area would accommodate all of the population of the United States and Mexico. 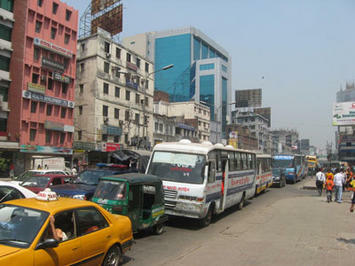 Dhaka’s Impossible Traffic: The urban area is from five to seven miles wide and from 15 to 20 miles long, north to south. There is a single north to south thoroughfare through the whole urban area, which the Inspector General of Police estimates is blocked for 6 hours per day at railroad crossings. Needless to say, with its density inducing traffic congestion and insufficient road infrastructure, Dhaka’s traffic is horrific. The Poverty: There is, of course, the grinding poverty. Most recent estimates place the gross domestic product per capita of Bangladesh at under $1,500 annually (purchasing power parity). Dhaka is very likely the world’s poorest megacity. Progress is being made, principally from the fruits of globalization. There has been strong growth in garment production and huge numbers of jobs have been created. However, even this progress is threatened by inward-looking anti-trade movements in developed countries whose proponents ignore the likelihood that their policies would drive the poor of Dhaka into even greater decrepitude. Even if these selfish intentions fail, it will take decades for Bangladesh to join the ranks of middle income nations, much less high income nations. That, nonetheless, should be the objective. 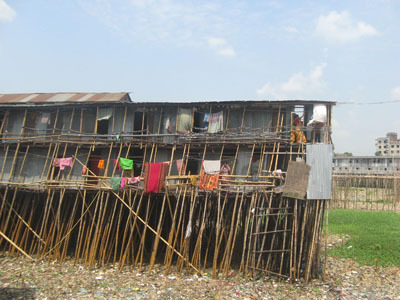 The Shantytowns: Various estimates indicate that up to one-quarter of Dhaka’s population lives in informal settlements (shantytowns, slums or favelas). These settlements tend to be “marbled” throughout the urban area, along the streams, railroads, lakes and ponds and in the drainage canals. However, none of the shantytowns are so expansive as those in Mumbai. Perhaps that is because commerce is decentralized in Dhaka, with garment factories spread throughout the urban area. People in the shantytowns have to work and many walk to their jobs, both factory and domestic. Their lives are precarious. Population densities in the slums have been reported as high as 4,200 per acre, which converts to more than 2,500,000 per square mile or more than 1,000,000 per square kilometer. At that density, the population of the world could be accommodated in the Tokyo-Yokohama urban area, leaving 10 percent of the land for open space. The Draw of Dhaka: Why do they come to Dhaka? What is the draw of a place that to western eyes could be dismissed as one of the least attractive urban environments in the world? It is the same incentives that drew people to Chicago from the farmlands of Poland, Italy or Iowa and to Sao Paulo from the sugar plantations. People routinely seek better lives. As in other cities in the developing world (or the developed world before), rural populations did not migrate to Dhaka because they were better off where they came from. Moreover, virtually all of the migrants from rural areas could return home tomorrow. Not surprisingly, few do. Moreover, there is progress, even in the shantytowns. Many residents “cook with gas” and have access to electricity, even if pirated from adjacent lines. There are schools where the children of the migrants are exposed to the foundation of literacy required for better lives in the future. Dhaka: City of Hope: Of course, it is all a matter of perspective. Dhaka may not look pleasing to affluent foreigners. Few residents of Portland, Paris or Perth would willingly embrace even a privileged lifestyle amidst the poverty of Dhaka. 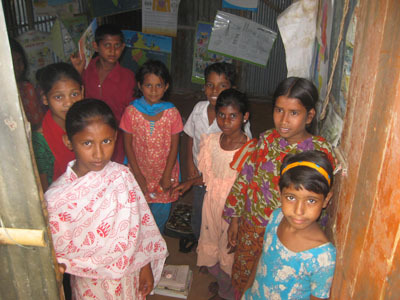 But despite the intense challenges, for the rural poor of Bangladesh, Dhaka remains very much a city of hope. Submitted by saame1213 on Thu, 08/14/2014 - 11:21. Submitted by saame1213 on Thu, 08/14/2014 - 04:51. A notable share! We've simply sent this kind of onto some sort of associate who have already been performing passbook a bit homework for this. As well as he the truth is purchased us supper simply because I came across it for your pet... lol. Consequently i want to reword this kind of. Submitted by tsflw on Mon, 08/04/2014 - 04:57. Submitted by Stewart44 on Wed, 01/15/2014 - 00:01. Third Party Inspections is a program utilized by many public agencies to promote economic development. The third party organizations must meet the requirements set forth by the public agency for approval of provider ship within their jurisdiction. Submitted by quangstar on Mon, 07/21/2014 - 02:57. Submitted by enggal on Thu, 06/19/2014 - 14:16. Submitted by syncseo123 on Sat, 12/07/2013 - 08:04. Submitted by quangstar on Fri, 08/01/2014 - 04:26.
team and are looking for ways to solve. Recently in America, tested Dutch coach Ashley Young left side stones diagram 3-4-1-2 and England midfielder appeared to adapt to the new M88 as more natural on defense and demanded question the ability of the comprehensive procedure. If Young ice well, he will share the position with M88 Luke Shaw and the rest of Van Gaal is looking to add 2 central defender. Submitted by asadalikhatrint on Sat, 10/19/2013 - 10:43. Submitted by asadalikhatrint on Fri, 10/18/2013 - 12:06.